WALNUT CREEK, Ohio — The Hiland FFA hosted its 58th annual banquet April 16. Award recipients included: Top Greenhand: Cheryl Yoder; Star Farmer: Hunter Mast; Star Agricultural Science Award: Diane Yoder; Outstanding Member Award: Nikyta Engstrom. Mechanical business: Brandon Raber; agricultural business: Tallie Troyer; senior capstone: David Mast; Animal and plant science: Tess Miller; science and technology of food: Regina Nisley; and agricultural, food, and natural resources: Hayleigh Scheufler. Scholarship Award: Mechanical business: Brandon Raber; agricultural business: Nikyta Engstrom; senior capstone: Brandon Raber; animal and plant science: Hunter Mast; science and technology of food: Diane Yoder; agricultural, food, and natural resources: Hayleigh Scheufler. State Degree: Natalie Lovell, Tallie Troyer, and Diane Yoder. Honorary member: Holly Troyer. Teams from the career development events were recognized. The urban soil judging team of Drew Mast, Hunter Mast, Ryan Mast, Brandon Raber, and Diane Yoder placed 14th at state competition. The District 8 trap shooting team brought home third place and consisted of Carson Feikert, Marlin Hershberger, Alex Jamison, Ryan Mast, Brandon Raber, Will Stolfus, Parker Stutzman and Tallie Troyer. Hayleigh Scheufler placed first in the freshman division at the job interview competition, then placed third at state. Alisha Hershberger placed fifth in the sophomore division, and Nikyta Engstrom placed fifth in the senior division of the job interview competition. The team of Tanner Neuenschwander and Lexi Raber placed fifth at district competition in the agricultural power diagnostics or tractor troubleshooting contest. The team of Sierra Hershberger, Tess Miller, Lexi Raber, Cheryl Yoder, and Diane Yoder placed 24th out 91 teams at the Marysville Invitational on the equine management contest and placed 40th out of 124 teams at state. The new officers were introduced. Sentinel: Claire Farquhar; student adviser: Natalie Lovell; reporter: Cheryl Yoder; treasurer: Parker Stutzman and Bailey Engstrom; secretary: Hayleigh Scheufler; vice president: Tallie Troyer; and president: Diane Yoder. The Hiland FFA Veterinary Science team of Nikyta Engstrom, Hayleigh Scheufler and Cheryl Yoder participated in the Veterinary Science contest in Columbus, April 13, and placed 23rd. MILLERSBURG, Ohio — The West Holmes FFA chapter held its 50th anniversary FFA banquet April 15, at West Holmes High School. Star Greenhands: Taylor Feikert and John Hughes. Outstanding junior: Chris VanSickle; outstanding sophomore: Juanita Miller; outstanding freshmen: Hunter Smith and Preston Baker. State Degree recipients: Erik Hanna, Michael Klein, Regina Miller, Hannah Schlegel, Becca Vales, and Chris VanSickle. American Degree recipients recognized were: Chris Sprang, Shyann Kick, Elise Neville, and Morgan Hoxworth. Proficiency finalists: Beef Entrepreneurship, Carter Smith; Turfgrass Management, Jason Jenkins; Nursery Operations, Elise Neville; Diversified Horticulture, Justin Lorentz; Dairy Production, William Hughes; Grain Production, Michael Klein; Forage Production, Gabe Armstrong; and Small Animal, Jillian Gurley. William Hughes was recognized as a Star State Farmer finalist. This year the chapter sold 693.5 cases of fruit worth $31,104 and 1,754 tins of nuts worth $17,704 The chapter also sold 90 flats of strawberries for a separate fundraiser, totaling $2,492. Jason Jenkins was voted as FFA King and Becca Vales as FFA Queen. New officers were installed: president, Chris VanSickle; vice president, Becca Vales; secretary, Alyx Morris; treasurer, Regina Miller; reporter, Abby Rohr; historian, Erik Hanna; sentinel, John Hughes; and student advisor, Taylor Feikert. The West Holmes FFA General Livestock team participated in the state contest with team members, Carter Smith, Chris VanSickle and Hunter Smith. The dairy judging team tied for sixth place and advanced to finals with team members, Regina Miller, William Hughes, Logan Schlauch, John Hughes, Mike Kick, Alyx Morris, and Jason Jenkins. The Small Engines team placed fourth in the district competition with team members: Michael Kline, Douglas Moore, Erik Hanna, Dylan Harsh, Chris VanSickle, Coven Mullet, and Jake Mullet. FAYETTEVILLE, Ohio —The Fayetteville FFA Chapter installed officers for the 2016-17 school year on April 14. The new officers are: Bailey Barber, president; Blaise Boler, vice president; Haley Moore, secretary; Tyler Kingus, treasurer; Faith Stegbauer, reporter; Lakota Pitzer, sentinel; and Jason Stephens, student adviser. These members were elected April 1 after they went through an interview process and were voted upon by chapter members. Retiring officers include Venus Bryant, Aurora Mullins, Tara Carnes, Meghan Koch and Laura Stahl, Sentinel. Ten members traveled to the Ohio State Fairgrounds April 2 to compete in the spring career development events. The agronomy team of Jason Stephens, Andrew Stephens and Sarah Collins placed 17th in the state out of 32 teams. The livestock judging team placed 38th out of 169 teams. Individually, Faith Stegbauer placed 41th out of 899 individuals and Bailey Barber was 225th. They competed with Lakota Pitzer, Blaise Boler, Sarah Ward, Mark Wolfer and Bethany Leggett. SULLIVAN, Ohio — The Black River FFA held its annual tractor drive-in April 25. Eight students and one teacher drove their tractors to school to display throughout the day. In addition to displaying their tractors in front of the high school, the FFA members drove over to the Black River Electric Cooperative, where preK-8th grade students had the opportunity to participate in a farm safety demonstration. The FFA students demonstrated the danger of a PTO shaft, explained how to safely maneuver around and on equipment, safety on the roads, and explained the power of the tractors and how much they weigh. The following student participated in the drive: Brandon Heath, David Markiewicz, Tony Strojin, Scott Jeffery, Eric Cordonnier, Morgan Czarny (who drove a John Deere 9500 combine), Blake Widenmeyer and Lexi Czarny. High school teacher, Mrs. Berry, also drove her tractor to school and participated in the drive. SALINEVILLE, Ohio — The Southern Local FFA held its annual banquet April 14, with 229 members and guests attending. 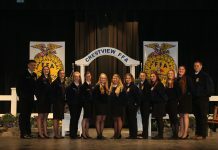 Students were awarded for career development event participation, FFA scholarships Greenhand and Chapter Degrees, as well as naming the 2016 Star Student awards and honorary membership. This year’s honorary membership was awarded to community members and FFA alumni, Tim and Jean Roush. The Star Greenhand Award, which recognizes an outstanding first-year member, went to Cole Birkhimer. The Star Chapter Farmer was awarded to fourth-year members Bethann Callahan, Mickenzie Mosti and third-year member Sean Growe. New officers installed include: president, Natalie May; vice president, Luke Frischkorn; secretary, Emily McDonald; treasurer, Joseph Wilson; reporter, Brooke Echols; sentinel, Lucas Johnston; student adviser, Jerred Gfeller; parliamentarian: Laci Growe. In addition, for the first year, the Marcus K. Walter Memorial FFA Scholarship was awarded to recognize seniors who exhibited outstanding community service and demonstrated the last line of the FFA motto “Living to Serve.” Recipients were Autumn Vincent and Sean Growe, who each logged over 225 hours in community service throughout their high school career.